Gotta disagree with you on this. First, the problem with deomocracy should never be someone running for office. But more important, save the fistpounding for the 3,000 retured Jews who had their votes stolen because they were tricked into voting for Pat Buchanan. Surely having many Holocause survivor's votes shifted to a neo-con like Buchannan should be MUCH more troubling to you than Nader voters. No one to blame in 2004 - except a dispassionate dem race and florida stolen election commission. If Nader wasn't in the Florida race, and Gore got his votes instead, it wouldn't have mattered a lick what Jeb Bush and Katherine Harris did. Nor would Gore's weak campaign, which I agree was lame, mattered. Everyone begged Nader to get out of the race because HE COULD NOT WIN. And the only thing he could accomplish by running would be to help George Bush get elected by syphoning votes away from Gore. Look, the country has been very divided these past several years, and the last several elections have been closer than ever. It was a slam dunk for Bush with Nader in the race, and we all knew it, except the Nader people. We all knew that this state we're in today would be the result of a Nader vote. The Nader voters naively gambled away the country's future. The Post-Naderite inner guilt must be so enormous. Luckily, I don't know because I voted for the superior man even if it WERE a true three party system at the time of the 2000 election- Al Gore. Al Gore would never have endangered his country the way Ralph Nader did. What an egomaniac Nader is. Criminally irresponsible. I am not suprised that Nader voters make 1,000,000 excuses now- the deep down guilt must be horrendous. Look what they helped vote into power. Look at the pile of d-g sh*t we're in now. THANKS, MR. NADER. THANKS!!!!!!!!! And thank you, Nader's lemmings. I typed my fingers to the bone back then trying to get Nader supporters to see reality. Well, reality is upon us! Even if the Dems win control of the Senate and Congress (yea, right), the courts will rule for the rest of my life. I never thought I would see the day when we would return to the 1950s. Women are in for a big surprise and it won't be pretty. Andy, you and I have the same feeling about Nader but we really need to face the fact that Bush was going to win that election no matter what. To have so many things go wrong is not just a fluke, it's corruption at the highest level. Voting machines that didn't work or have paper trails, people denied access, the chads, the total screw up with so many voting for Buchanan and then the final draw of the Supreme's. No matter what Al would have done he would have lost. Then we come to 2004 and the same crap happens all over again. Still no paper trail for the machines, the debates were rigged (remember the device Bush had on his back for two of the debates) and then the election was rigged. Election eve Zogby sent out a 5 pm email poll saying that Kerry was ahead in all of his latest polls in the toss up states and he had been right on for months previous. Remember, all Bush had to do really was fix Ohio, PA and Florida or even just one of them to pull off a win. John Zogby came back with total disbelief and many questions about the out come as all of us did too. Once again Bush pulled off the unthinkable and hold on to your hats my friends his party is not finished yet. The Dems have a lot of work to do but more so the media has to come alive. The party slogan for the Democrats should be, "Have YOU had enough YET"? Tally up the votes Nader got in Florida and give them to Gore instead and we'd have a President Gore. Nader's 97,488 votes obviously would have tipped the difference. He also got roughtly 2.8 million votes nationwide. I don't care how many voting booths were rigged, etc. All Gore needed was 518 more Florida votes and he;d have won the state, and thus the election. Did you ever stop to think that Nader voters would likely have not voted at all, or a write-in (for Mickey Mouse?)? Nader voters were so repulsed by Gore and then Kerry they would rather throw their vote away than vote for them. It is amazing how neatly compartmentized thinking goes on here without regard for variables. It is also very funny that all elections that Dems lose are labled as stolen and rigged. The GOP is not the party resisting true election reform to ensure fraud does not take place. The only real way to do that is with photo ID's and the Dem always resist it with flimsy excuses. the main piint is this: Dem's BEGGED the Nader supporters not to throw away their votes "in protest" for a candidate that had ZERO chance of winning. We told them that a vote for Nader was a vote for Bush, and asked them wouldn;t they rather see Gore elected than Bush? We warned them abaout all this mess we're in today, including the likelihood that Bush would shift the Supreme Court dangerously to the right. And that's exactly what happened, yet these poor souls insisted on "sending their message" anyway. And now look what we've got. Thank you Nader voters. And thank you Nader, you self-absorbed selfish loser. The main point is this: the Democrats, so called, spent more effort trying to keep Nader off the ballot than they did attacking the real problem, namely the Publicans. You are seriously confused, and projecting your anger onto the easiest available target rather than the correct one. Nader had and has nothing to do with your problem. Complain about the Democrats and the Republicans. If the Democrats offered a real choice, they'd win. As long as they're Republican Lite, they won't get my vote, and they won't get people to make the effort to go to the polls. I'd even go further and say, they don't deserve to win unless they start standing up for old-time FDR-style Democratic values. There's still a majority for that, if the Democrats would get a spine. But look at what they're doing right now: whining about Nader having stolen their votes rather than staking out truly Democratic positions. THEY DON'T OWN MY VOTE. THEY DON'T DESERVE MY VOTE. Gore won in 2000. Nader did not steal it, the evil that is the Republican party did. Having a choice in an election is the cornerstone of Democracy. That Gore's campaign was pallid and unable to woo the media was in part his fault (I still give majority blame to the grossly irresponsible press). That the Republicans continue to get away with the treasonous crimes they do is America's fault because so many people believe in the quasi-Christian-psychobable and fear/hate-mongering of the Right (evidence: the 2004 election). This makes stealing a mere few thousand votes so potentially lucrative. Above all, since we no longer have a critical mainstream media, we are all in for a long period of serious trouble. Chuck, if you go back to Oct 13 and 10/17 on this blog you'll see an extremely comprehensive outline of government reforms and a policy platform I put forth for the DNC entitled "Democrats Need THE Message" and "Time for a New New Deal." However, I am also at liberty to point out the simple fact that Ralph Nader's grotesque display of political masturbation just may end up stripping my wife, daughter and your loved ones of personal freedoms we've valued for decades. And it's resulted in a useless war with tens of thousands dead. You're right, the Democratic party needs to demonstrate what it stands for. And I obviously agree that FDR's New Deal is a great benchmark. But one thing has nothing to do with the other. Gore won the popular vote, had the electoral college stolen from him, and Nader sealed the deal. Plain and simple. And for that we should all be angry. In any event, thanks for reading. We welcome all opinions here! Andy, in spite of disagreeing with you 99% of the time, your way with words keeps me coming back. "Ralph Nader's grotesque display of political masturbation ..." is classic, an entire day's worth of entertainment. Re: "...the one who pulled all those votes away from Gore, especially in Florida..."
Baloney. 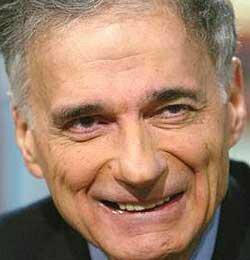 Bush got 12x the number of Democratic votes that Nader did. Gore ran a crummy campaign, which is why the Flordia vote was even close. Even so, we all know the SC handed Bush the Presidency illegitimately. The Democrats are suffering not because of Nader, but because of a lack of spine. They have played the 'Republican-Lite' strategy and it has resulted in their being totally marginalized. Right now the Democrats have Bush on the ropes, but all they seem to be able to do is...NOTHING. I love the way you get the blood boiling Andy, keep it up. Yeah Al Gore was a bit naive in 2004, never thinking Bush Jr. would stoop to the low levels of Bush Sr., big mistake. These people can not be trusted and we found that out from the 2000 election. Then in 2004 Kerry really didn't get the message from the previous election and he too blew it but the fact still remains the dumb voters couldn't see it either, we could but the ones voting for Nader and Bush throwing away their votes sure didn't. The one thing that continues to puzzle me is what in the hell do people see in Bush? What has he done for the average person in this country? Why are the poor workers making due on minimum wages (Wal-Mart) think this administration is so great, have they really no gray matter after all? Wouldn't you think that after 4 years of a do nothing administration people would want a change, at least from a president that could put more than two words together? I guess we can blame Gore, Kerry, Nader or anyone we can think of but we really have to blame the voter for not being informed and not thinking past the beer in their hand or the sitcom/sports on TV. When you ask the average person about politics they haven't a clue what is going on, not a clue and that my friends is why we have what we have. What will it take to get these people interested, offer a beer and sandwich at the polls? Blaming the Nader voters in 2005 is SO beside the point. Yeah, they piss me off too, inasmuch as a lot of liberals piss me off, because we simply can't strategize in the face of a ruthless opponent whose followers march in lock-step. But how about we place blame for our current situation where it belongs--squarely on the shoulders of Mr. and Mrs. America who would rather have the *appearance* of "safety" than freedom and justice? actually, blaming the Naders IS the point. The election wass close, like to many are: 1960, 1968, 1976, 1996, 2000 and 2004. Which is why Nader was the spoiler. yes, we CAN blame him and his misguided followers. But Nader is hardly a factor NOW, so it seems kind of pointless to take him on. Or to blame him for the nomination of Alito. There are so many other factors at work, and isolating him as the primary reason that we're facing this Supreme Court showdown seems a little short-sighted. Believe me, I am no fan of Nader or his voters. But this whole post seems so out of left field. Curious that Gore couldn't muster the firm stances needed to win back Naderites, much less pick a position and stick to it. Trying to appeal to too broad an audience will get you every time. Interestingly I too voted for Nader, but measured against the fact that I live in a district which goes Repub by 70% every election, would you still heap your scorn upon me? Was I a factor by simple virtue that I voted Nader? Things are never so simple, and anyone who thinks otherwise knows not that they know not, which is unfortunate. To blam Nader voters is foolish, divisive and mean-spirited. Personally, there is enough blame to heap aplenty on both Nader and Gore for their ineffective campaigns. Gore handlers and strategists must have been either on drugs or reading out of the "Presidential Campaigns for Idiots" play book. What remains to be seen is whether progressives will continue to expend precious energy whining and pointing fingers instead of hitting the pavement to take the fight to the rethugs. Actions speak louder than words. Let's focus on the mid-term elections and capturing at least one of the two legislative bodies back. Then let the investigative games begin. If nothing else, America will again be reminded of the corruptive nature of Republicans and thus usher in another era of democratic rule...unless the Dems continue to sell themselves as Repub-lite. I'm really glad to have come accross your blog. I intend to add it to my links www.contestedterrain.blogspot.com. But I can't agree with your argument about Nader. Although I didn't vote for him, most of the people I know who did would not have voted for Gore if Nader hadn't run. I simply don't believe that the way to strengthen democracy is to reduce the number of people speaking out. Running for office is one way to be heard (but, unfortunately, not in the mainstream media). Much of what Nader had to say, particularly about fair trade and the global economy are essential to any left understanding of the world today. Blaming Nader for the newly resurgent right-wing capture of the institutions of power in the U.S., simply ignores the long history of the Democratic Party's strategic mistakes and abandonment of the principles that made it what it was. It has always been an amalgam of disparate forces that can only be held together by a very strong candidate (Roosevelt, Kennedy, Clinton). Neither Gore nor Kerry could manage it. Although it's a mistake to overlook the fact that Gore actually won the 2004 election and then it was taken away by the machinations of brother Jeb in Florida and Scalia on the Supreme Court. If that had happened in any other country, it would be called a coup, not an election. Had Gore sat down with Nader during the campaign and either offered him the vice-presidency (instead of the extreme right-wing choice he made) or at least incorporated most of Nader's issues into his campaign - Kerry never did either - then things might have been different, but I'm not certain even of that. I think the time has come for us - on the left - to realize that we can't depend on either party to do our work for us, we have to do it ourselves. If that isn't clear from even a superficial reading of U.S. political history, it should be obvious from the recent behavior of the right-wing in it's dealings with Bush and the Republicans. They certainly understand the dynamic. Ah well, I've gone on far too long. But I really am happy to have found your blog. I will come back to it often. Good luck, peace. If those people who voted for Nader would NOT have voted for Gore had Nader not been in the race, then they are truly misguided. How anyone who values personal freedom and the true principles of Democracy would either vote for Bush instead of Gore, or worse, sit idly by and not vote at all, is beyond belief. Look at the result. Is the question: "Why did Gore get so few votes?" Or is it: "Why did Bush get so many?" I like Gore, but I wouldn't have voted for him in 2000. He seemed out of touch and uncomfortable with himself. If he changes his tune and comes in to the race like he normally is he'll have my vote in 2008... unless I run... NOT! Democrats are such a weak bunch who never cease to amaze me. They can never truly see the forest throught the trees. The repugs' political reality is all about WINNING. Take no prisoners, do whatever it takes. Which is why they win. Democrats political reality is all about style over substance. Appearance. Being politically correct. "Making statements." "Sending messages." Which is why we lose. And I don't get this crap about sitting out elections and not voting for Gore, kerry, etc if you are a Democrat. I'd rather vote for Oprah Winfrey, Brad Pitt, Stephon Marbury, P. Diddy, John Kerry, or Al Gore instead of Bush or a republican. Give me a Democrat. ANY Democrat. Look what the other side has given us. Is this what you wanted? issue. That is the key to this whole mess. If that inside job does not come out, we are in for a lot worse. Look up question911.com and go to downloads. If you watch just a few of the 20 videos, you will understand. Loose Change is probably has the best slow mo video the the demolition of the twin towers and wt7. "Wah! Wah! Wah! Nader made us lose! WWWAAAAAAHHHH!!!!!!!!!!" Why don't you scream and throw your toys and pound your fists on the carpet like the emotional toddler that you are about John Kerry's campaign? As you admit yourself, there was no Nader to blame in 2004. Oh, wait, that would mean holding Democrats responsible for their actions. Can't have that now, can we?